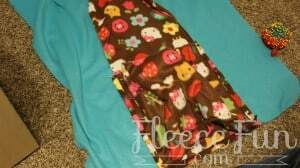 This Doll Sleeping Bag Pack How to comes with a free pdf pattern. 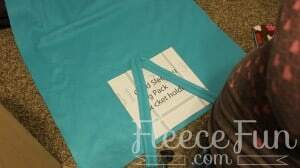 You can make a back pack that turn into a sleeping bag! Perfect for trips to grandma’s, sleep overs, day camp and more! 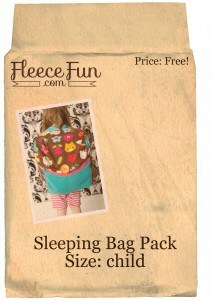 The sleeping bag pack comes with extra pockets to hold pj’s, books, and treats. This pattern is very involved so please read through all the directions a couple of times before beginning. 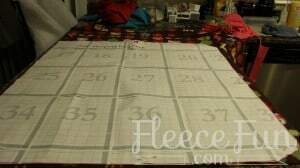 The current pattern the finished size is 32 inches wide by 50 inches tall. This will fit a toddler to a 5 year old comfortably. The back pack section has room the hold a larger size. 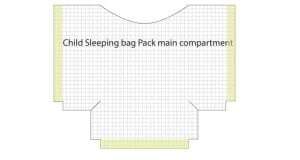 I will be adding an “expansion kit” to make the sleeping bag section larger- be sure to sign up for the newsletter to know when that is added. 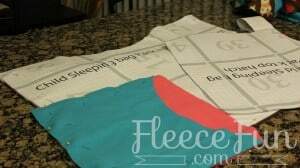 You will have left over scraps with this pattern that can be made to make pants, hats, and scarves – make your child a whole coordinated outfit. Please note that you will be sewing through very thick layers. 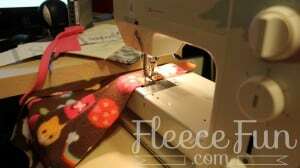 This project requires a sturdy machine – it will not work with feather weights. This pattern is very large. Assembly will take some time. 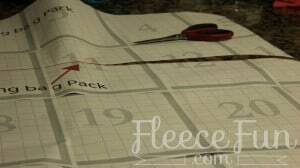 It’s important that you take your time to assemble the pattern nicely for a good result. 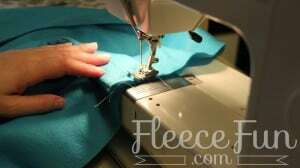 You can find a video and written instructions on how to assemble a pattern here. Be sure to use enough tape to make the pattern sturdy. 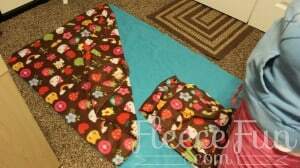 Again you will have plenty of large scraps to make other projects out of. We’ll be leaving several raw edges on the bag pack. 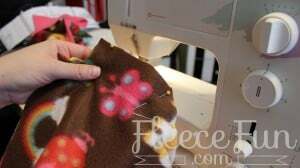 To keep the pieces fron stretching and getting mishapen, run a zig sag stitch (or other deorative stitch) along the edges of the top hatch, the top of the pocket holder and the outside pocket, the top of te main compartment and the blanket. 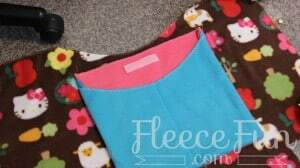 Place the outside pocket on top of the the other pocket. 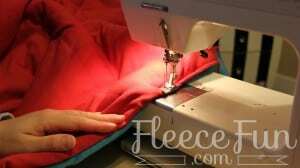 Optional – using a marking pen mark down the middle of the outside pocket and topstich down the front tof the pocket to make two small pockets. 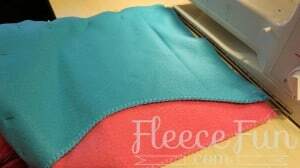 Sew on a three inch segment of Velcro onto the right side of the pocket holder. Sew the other half onto the wrong side of the top hatch (see picture) If you want a button on the top hatch sew it onto the right side at this time. Place the two strap pieces wrong sides together. Pin. 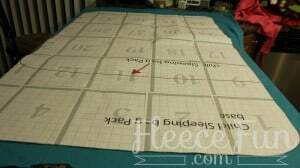 Sew each side using a .5 seam allowance. Using a safety pin turn long tube right side out. Flatten out as best you can, then top stitch down the middle of the strap. Set aside. Place the pocket onto the right side of the main compartment (this will be the body of the bag pack) The Pocket is places just below the curve and should end before the angled slits in the bottom. pin. Top stitch using a zig sag along edge of the pocket around three sides (leaving the top open) to attach the pocket to the compartment. Taking the bottom inside pieces (see image) place them right sides together and using a .5 seam allowance (approx) . You may just want to draw a line on the fabric and follow that. 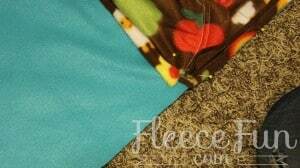 Using the pocket holder as a guide, place is on the right side of the fleece base (color2). Center it. Taking the long strap piece fold it in half, place the middle at the top center of the pocket holder. Bring the straps to each corner and pin. 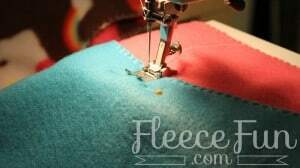 Using a straight stitch sew on the ends and center of the straps. 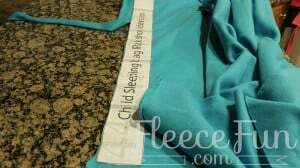 Note: The straps are long if you leave them the length they are it will work for an older child 10 -12, but for a younger child you will want to cut off 3.5 inches from each side. Now it’s time to add the top hatch section. Again using the pocket holder as a guide, place the hatch as shown in the picture. Note that right side is facing down. Hatch will sit on the folded section of the straps. Pin well. With wrong side of hatch fabric facing up sew on .25 inches from the edge, and then sew again .25 inches from the seam you just sewed for extra reinforcement. Now It’s time to add the back pack body (main compartment) to the base. Pin the straps and the hatch so they are out of the way. Please note: We are making the back pack section inside out on purpose. Remember quillows? This pattern operates on the same principle. 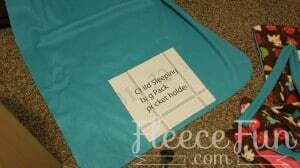 But instead of making a simple picket we’re making a back pack to hold the sleeping bag in. Using the pocket holder as a guide, lay the main compartment down onto the base. The top should be at the hatch the bottom that we sewed closed should be placed on the edge of the base. It should be puffy (it’s 3d now) and lay perfectly flat. 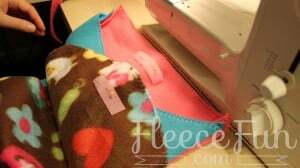 Pin well and sew on using a .5 seam allowance from the edge along the sides and bottom. 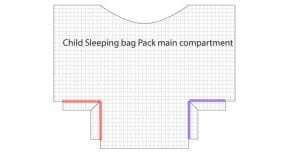 Test out your sleeping bag pack. 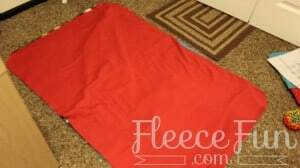 Fold up the base blanket into thirds width wise, then into thirds again(making sure the sleeping bag pack is on top, flip it right side out, stuff the base into the main compartment. It should look like a back pack and the hat should attach to the front. It’s very important to make sure that this is functioning properly before proceeding. Unfold the bag pack, lay out the base so the main compartment is facing you. Time to make a sleeping bag sandwich. Pin the main compartment so the bottom is out of the way and the hatch is tucked into the compartment. Next place the blanket ( fleece color 1) on the base. Right side facing down. 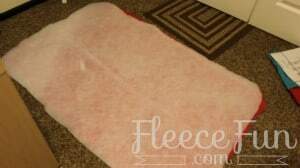 Pin the bottom and the side ( the side that doesn’t have a curved corner) to the base, then pin the top and the side with the curved corner back out of the way so it doesn’t get stuck in the seam allowance. Next place the Jersey knit base on top of the blanket and the base, right side facing down. Then Place the batting on top of the jersey knit. Note batting is optional for dolly. Pin around the edges well. 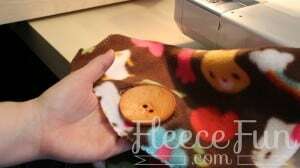 Leave a 3-5 inch gap on the side where the blanket meets the base for turning. 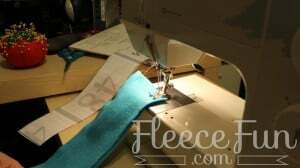 Step 12 – Sew the Sandwich together. I cannot stress this enough. Take your time! You are dealing with a lot of layers. Make sure that base layer stays flat. Using a .5 inch seam allowance sew all the way around the sleeping bag, leaving a 3-5 inch gap open. Snip little slits into corner ( taking care not to cut through seam). Turn right side out. Since we left the gap where the blanket is we can hide our stitches. 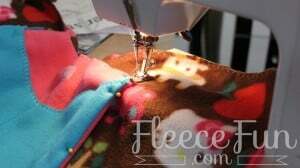 Taking a needs and thread stitch shut the gap, sewing between the blanket the jersey base. I know. It looks amazing, you can wait to get your little one in it. Just a couple more steps to make it extra durable. If desired top stitch around the base ( .25 – .5 ) This will give extra reinforcement for the batting layer and gives the edges a nice look. Again slow because it’s a lot of layers. Question-on step 6- am I working with two pieces of material or one folded. 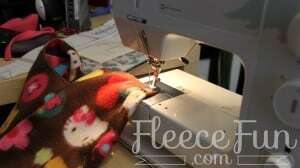 My biggest problem with pattern is that it doesn’t specify a double thickness or single when cutting out fleece. Okay, I got that part. I am having difficulty in attaching the main department. I thing I sewed the corners correctly; however, does it go over the straps ? Were the straps supposed to be sewn to the base at the middle of fold. Pictures are difficult to follow if you have no idea of how it goes together. Any input would be appreciated. I am an experienced sewer, but this pattern has be baffled. I am lost on how to sew the main compartment-is it just sewn at corners or do you fold the entire piece in half and sew all the way around-the pictures shows color on the inside corners and that is all I have sewn; however I have no idea how to attach since it cover the opening of the straps if I sew it on top of them. SUCCESS! I finally figured it out-thanks for your help-very cute! !